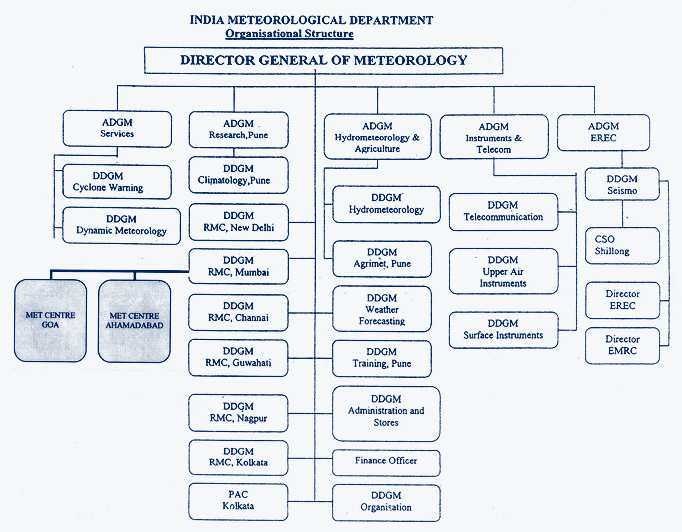 The Director General of Meteorology is the Head of India Meteorological Department with its headquarters at New Delhi. There are four Additional Director Generals at New Delhi and one at Pune. There are 20 Deputy Director General of whom ten are at New Delhi. For convenience of Administrative and Technical control there are 6 Regional Meteorological centres each under a Deputy Director General with headquarters at Mumbai, Chennai, New Delhi, Kolkota, Guwahati and Nagpur. Under the administrative control of Deputy Director General there are different types of operational units such as Meteorological Centres at each State capital. Meteorological Centre, Panaji, Goa is under Regional Meteorological Centre, Mumbai. • RS/RW RS/RW upgraded by G.P. Sonde. • Surface With 08 surface observations round the clock. DIWE and AWS is also installed. • Radiation with manual and Automatic Radiation Station (ARS). • Seismic RTSMN is installed in the unit which records real time Seismic data. The data is automatically transmitted to H.Q. through satellite. • DWR Earlier CDR, has been dehaulaged in December 2008 due proposed installation of DWR at MC Goa in the Ist Phase of Modernization of IMD. The construction/ modification work of existing bldg is in progress. • PMO Surface observatory at Mormugao records only 03, 06, 09,12 Z surface observations daily. All autographic surface instruments including Dynes PT Anemograph are also installed there. • PMLO IVOF and other Ships including foreign ships are visited for calibration of Barometer and other met instruments. • Out post Rainguage stations Mapusa, Pernem, Valpoi, Ponda, Margao,Canacona, Qupem and Sanguem. • AWS Automatic Weather Stations are installed at Panaji ; Ela (Old Goa) and Mormugao. • Communication High Speed Data Terminal (HSDT) VPN Circuit with speed of 256 Kbps for transmission and reception of Meteorological data is installed.